Our Instagram feeds are a hotbed of activity 24/7, and that means one fundamental (and frustrating) thing: Sometimes we miss even truly brilliant of outfit ideas. With winter taking a major hold over the here in the UK, now's the prime time to source a little inspiration in order to rejuvenate our tired cold-weather closets. How can that faux-fur coat from last year look full of life once more? What's the one pair of boots worth investing in? Are there some new layering methods you should know about? That's why we dedicated a huge chunk of time to sifting through the social media accounts of some of our favourite girls in order to bring you the latest looks you gather some intel from. As well as great winter outfit ideas, we've also handpicked the key item for each ensemble so you can be entirely focused in your approach. Go through the gallery below to see and shop our favourite new looks. 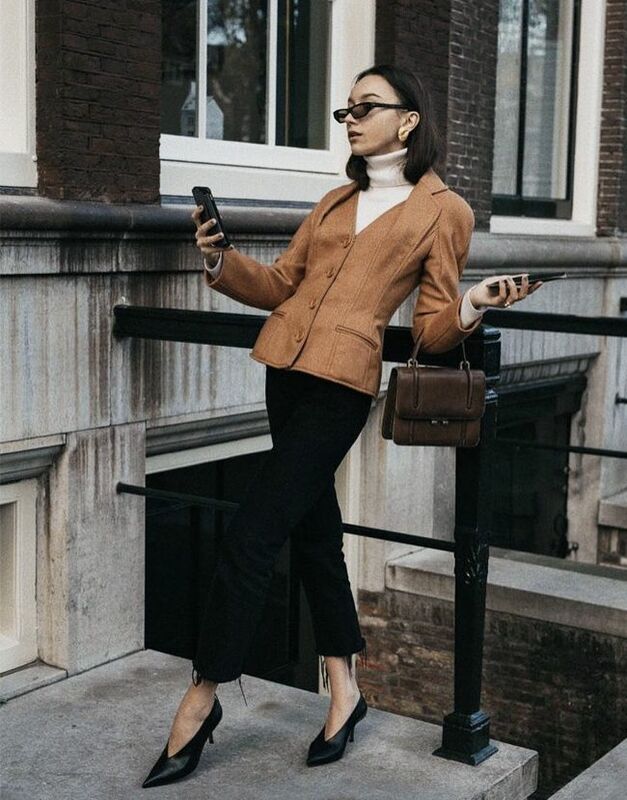 Style Notes: Beatrice Gutu of The Fashion Cuisine channels Audrey Hepburn in the most modern way possible—the raw hems, mini sunglasses and V-neck shoes bring a '50s silhouette into the here and now. Her look? Vintage Dior from Vestiaire Collective. Yes, they're finally back in stock. Style Notes: If you're looking for a way to pep up the faux-fur coat you've had for years, here's the answer. Soraya Bakhtiar's fuzzy jacket (from a cool French brand called Fuzz Not Fur) + cropped kick-flares + silver flats is an unexpected but actually quite easy combination. This looks so much more expensive, don't you think? Style Notes: Ada Oguntudo has definitely talked us into buying a pair of snake-print knee-high boots—just how good do they look with a menswear-inspired coat? These also lace up at the back. Style Notes: Courtney Trop of Always Judging is a trusted source for out-of-the-box ideas, and this tartan and pink corduroy mix is definitely not one we could have predicted—pretty meets punk. Even if you don't wear a whole suit, consider some pink cords as your new jeans. Style Notes: Anna Vitiello has kindly provided us with a master class in winter layering—golden colours and baggy pieces all masterfully cinches by a gigantic belt. Cost-effective outfit transformer, comin' right up. Style Notes: With a perfectly 2017 take on Clueless style, Bettina Looney also shows how to mix high and low: Her skirt suit is from Mango, while her glittery boots are from Chanel. Style Notes: Carmen Grace Hamilton of Chronicles of Her has the casual wardrobe of our dreams. She's given this trusted formula of blazer and denim a reboot via her skinny shades and red lipstick. This feels very French to us. Style Notes: Glamometer's Viky looks cosy and festive in this jolly red combo. Note the coffee—it's even more essential than her brilliant Balenciaga shoes. Definitely worth saving up for. Style Notes: Maria Bernad's neutral outfit is beautifully punctuated with red accessories from head to toe. We're also rather taken with her vintage Dior saddlebag. Vintage Dior bags are making a comeback. Style Notes: Ellie from Slip Into Style has a genius idea for relaxed party dressing, and we're more than into it. What you lack in warm outerwear, you'll make up for in furry accessories. Style Notes: Tiffany Hsu is particularly good at combining luxury pieces with streetwear—just the simple addition of white high-heeled boots lifts this look from post-gym to posh brunch. Dries Van Noten accessories are always a pleasure. Next up, the autumn/winter 2017 trends you should know by now.